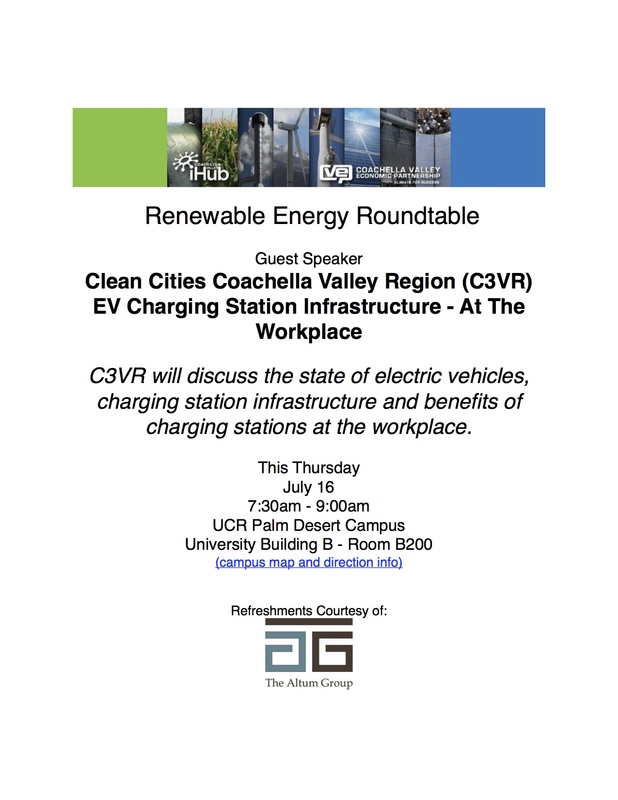 Electric Vehicle Quarterly Webinar – March 12 at 10 a.m.
C3VR will discuss the state of electric vehicles, charging station infrastructure and benefits of charging stations at the workplace. Does your employer offer charging for employees’ plug-in electric vehicles? Workplace charging offers numerous benefits to employers, such as demonstrating their industry leadership, providing a unique employee benefit, and increasing their environmental sustainability. This month, the Vehicle Technologies Office (VTO) was pleased to make multiple announcements about the EV Everywhere Workplace Charging Challenge. In addition, VTO’s Clean Cities program also released a Notice of Intent for a potential Funding Opportunity Announcement. Last Tuesday, the Workplace Charging Challenge held its first ever Summit, bringing together about 100 Partner partner organizations, ambassadors, and other interested stakeholders. At the Summit, the Office of Energy Efficiency and Renewable Energy’s Assistant Secretary Dave Danielson announced the Challenge has signed up more than 150 partners, a vast increase from the original 13 partners less than two years ago. In addition to the partners, there are also 16 ambassador organizations, and numerous Clean Cities coalitions working to support and promote workplace charging. The newest ambassador is the Edison Electric Institute, which at a separate event at the White House announced an Employee Adoption and Education Initiative to encourage its member utilities to install electric vehicle charging for their employees. At the Summit, the Challenge also released its first ever Workplace Charging Challenge Progress Update. Based on a survey of partners, the Update shows that Challenge partners are providing access to PEV charging stations for more than 600,000 employees at more than 300 worksites all across the country. These charging stations provide 6.7 million kWh annually, which saves more than 800,000 gallons of gasoline and 5.5 million pounds of GHG per year. That’s the equivalent of removing nearly 1,500 average cars from U.S. roads. A guide to meeting Americans with Disabilities Act requirements for workplace charging stations. Learn more about the Summit and how to participate in the Workplace Charging Challenge through an EERE blog post on the event or the Challenge’s website. Recently, Energy Department Secretary Moniz announced a notice of intent to support pilot aggregated purchasing models for plug-in electric and other alternative fuel and advanced technology vehicles. Aggregated purchasing, in which customers are “gathered” to maximize their collective buying power, can expand product availability and take advantage of volume pricing to help accelerate market growth. Learn more about the notice of intent on the EERE Exchange website. We are proud to announce the release of ‘A Guide to the Lessons Learned from the Clean Cities Community Electric Vehicle Readiness Projects’. Synthesizing reports from the 16 Clean Cities Plug-in Electric Vehicle (PEV) readiness projects across the country, the Guide gathers together the most important conclusions and highlights illustrative examples. Also see the “Ten Ways Communities Can Pave the Way for PEVs” on the EERE blog. 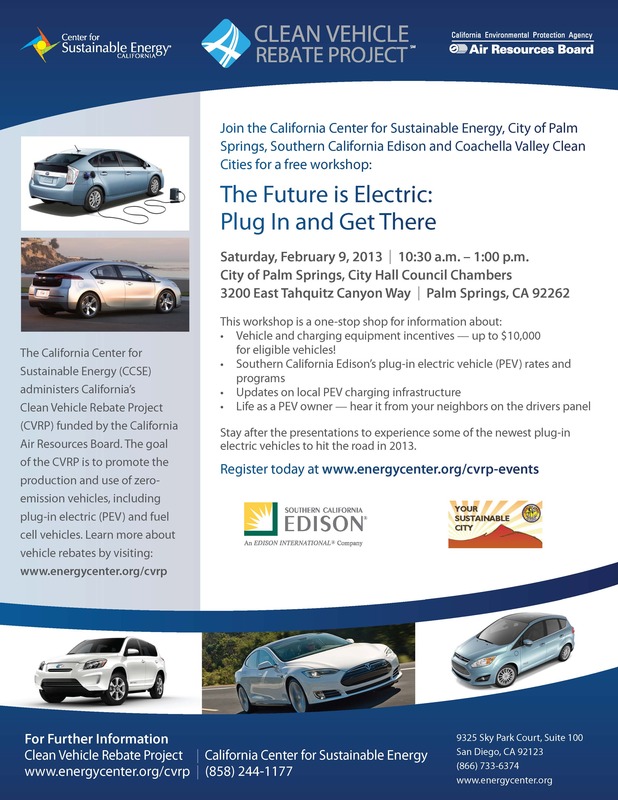 Join the California Center for Sustainability for Energy, City of Palm Springs, Southern California Edison, and Clean Cities Coachella Valley Region for a free Workshop. What is the impact of building efficiency measures on CO2 emissions? If a greater percentage of energy comes from renewable sources, what would the U.S. observe in energy consumption savings? Don’t miss out on this limited time opportunity! ChargePoint is giving away electric vehicle charging stations for the workplace. Applications must be submitted by Monday, October 15, 2012.